When it comes to spectacular flowers, most city gardeners have limited choices. The narrow plots typically found behind most brownstones and row houses get little light due to neighboring trees and adjacent buildings, so using showy plants that require hours of full sun is not realistic. 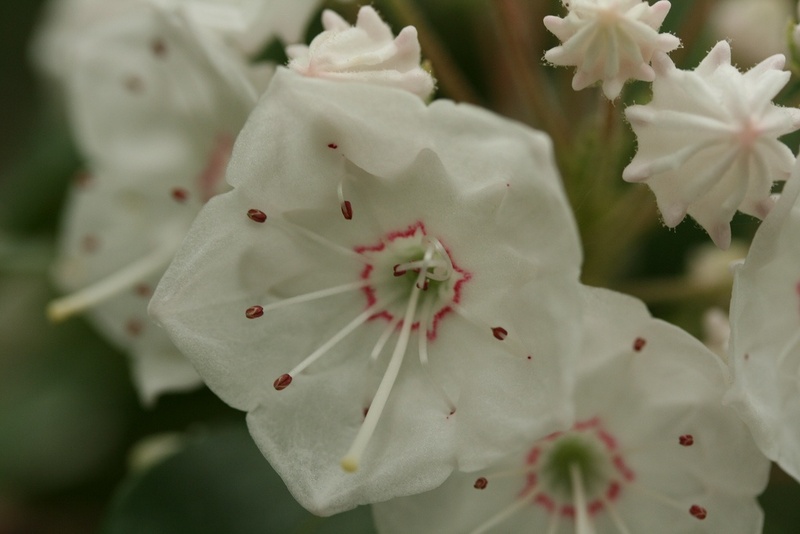 One often overlooked option is mountain laurel (Kalmia latifolia). This shade-tolerant North American shrub has gorgeous flowers that bloom in late spring and early summer. A close relative of rhododendrons and azaleas, it’s an excellent choice for a shady garden. It’s also evergreen, so even after the blooms have faded, its leathery deep green foliage provides a welcome sign of life. Even in the coldest winter weather, when rhododendron leaves have curled in on themselves, mountain laurel remains bravely open to the elements. In addition to being tolerant of shade, Kalmia latifolia produces exquisite clusters of delicate, fused-petal blossoms that resemble tiny origami rice bowls. When the buds burst open in May or June, the branches are virtually obscured by blooms. They can range from white to pink to deep rose and are distinctively tattooed with symmetrical maroon or purple dots or streaks. The bell-like flowers have a very unusual way of dispensing pollen. Their stamens are arched, with the tips held under the rim of the bell. When a bee or other pollinator lands on the flower, the weight of the insect releases the stamen, which flings up the pollen like a catapult. Mountain laurel is a member of the heath or heather family, Ericaceae. This family includes rhododendrons, azaleas, blueberries, and cranberries, all of which are woody shrubs that thrive in moist, well-drained acidic soil. Mountain laurel will grow in USDA Zones 5 to 9 in deep shade to full sun, but it does best in moderate to partial shade. In deep shade it won't produce as many flowers and can become spindly. Too-bright sun can cause scorching of the leaves. If you have typical Brooklyn clay soil in your garden, you'll want to create a nurturing environment for mountain laurel by improving drainage and nutrient content with organic matter such as compost. This shrub needs its shallow roots to stay cool, so mulch and keep your plant well-watered, especially during very hot, dry weather. An organic fertilizer like Holly-Tone, which is formulated for acid-loving plants, can be applied in the spring to enhance flower production. An individual mountain laurel shrub can produce thousands of seeds annually. It’s a good idea to pinch off spent flowers so the plant can put its energy into next year’s blooms instead of reproduction. Deadheading also helps to prevent legginess. Mountain laurel is slow growing, and at maturity, it averages 6 to 15 feet in height and width; dwarf cultivars top out at 3 to 4 feet. Although mountain laurel in the wild has been known to reach heights of 20 to 40 feet, there's usually little need for pruning. If your plant is growing too tall for your garden, it will survive hard pruning—even to a few inches above the ground—in the late winter or early spring. 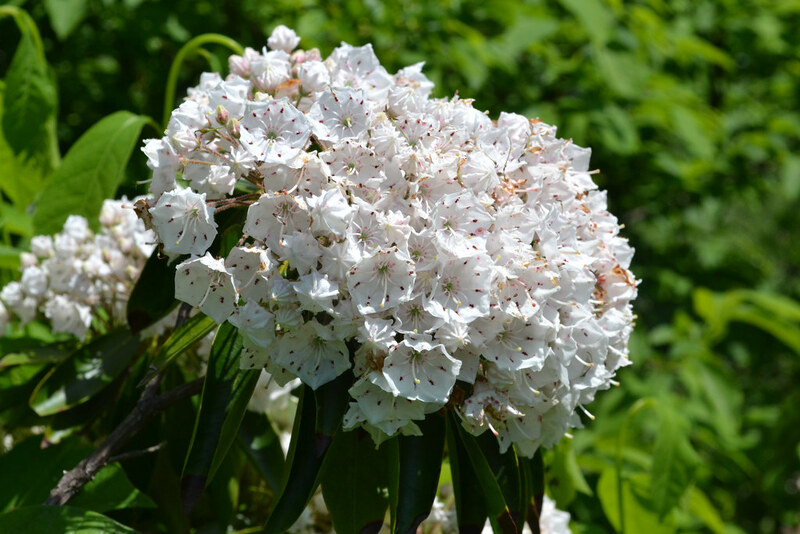 Given proper growing conditions, mountain laurel requires little maintenance beyond regular watering, but it can still sometimes fall victim to common garden ills such as blights, borers, scale, white fly, and lace bugs. A word of caution, especially if your garden is visited by children or pets. All parts of Kalmia latifolia are poisonous if ingested and can cause severe digestive upset and other alarming, though usually nonfatal, symptoms such as weakness and paralysis. Not all animals are affected—deer, unfortunately, are apparently immune to any ill effects and can be vigorous consumers of mountain laurel foliage. Mountain laurel was first recorded growing in the wild in 1624 and can be found on rocky ridges and mountainous forest areas as far south as the Florida Panhandle, as far north as southern Quebec, and as far west as Indiana and Louisiana. In spring it can be seen blooming abundantly along the Blue Ridge Parkway in North Carolina and, closer to New York City, in the forests of upstate New York, notably near Lake Minnewaska, in Ulster County. It is the state flower of both Connecticut and Pennsylvania. Mountain laurel is also part of the amazing flower display that takes place at Brooklyn Botanic Garden every spring and can be found in the Discovery Garden, Japanese Hill-and-Pond Garden, and Native Flora Garden. 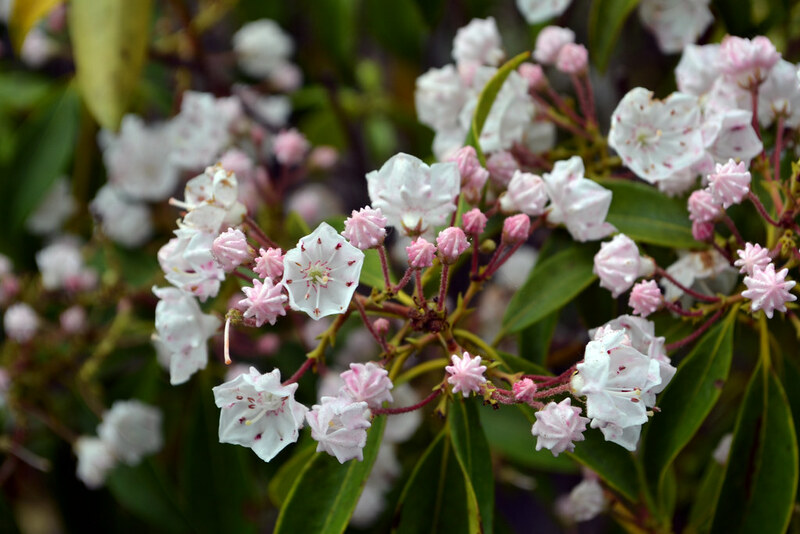 Which does the mountain laurel plant produce first—leaf foliage or blooms? We are beginning beekeepers and we were warned during a seminar that honey from mountain laurel can be toxic to humans. Kalmia latifolia (mountain laurel) in the Discovery Garden. Photo by Lee Patrick. Kalmia latifolia (mountain laurel). Photo by Uli Lorimer. Kalmia latifolia (mountain laurel) in the Native Flora Garden. Photo by Blanca Begert.